Thinking about moving your financial apps to the cloud? Chances are, you've asked yourself the same crucial question that's applied to every strategic decision in your business: What's the ROI? A solid business case not only unlocks budget dollars, it provides a roadmap for successful deployment and maximum value. The three steps to building an effective business case. How to calculate key financial metrics—such as ROI and payback period. How to prioritize your deployment based on five key ROI factors to maximize returns and minimize risk. 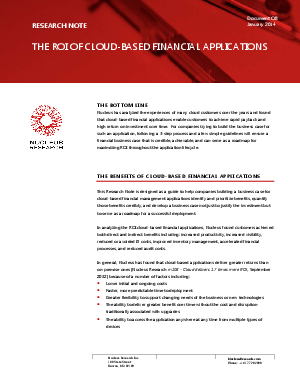 Results from real-life case studies of cloud-based financial application deployments.